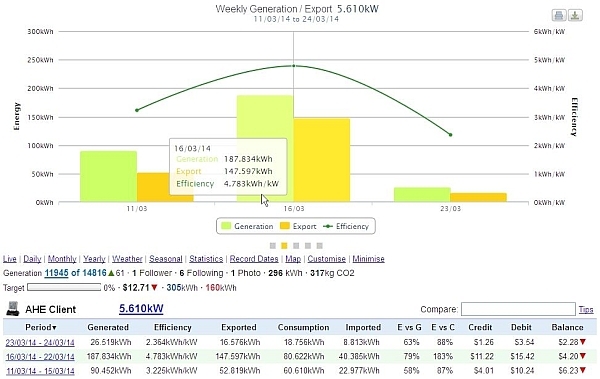 Missing Import Export For Current Cost Efergy Energyhive Monitoring? This is a worldwide service offering from Aussie Home Energy to get your energy monitoring data onto PVOutput. When you are connected via NET FIT metering, which is becoming the norm around the world, your energy monitoring dashboard if one of the above, is missing the important 'you need to know data'! Consumption & Solar Generation - MISSING Import & Export! Nobody wants to find out they are exporting their solar investment at ONLY 6 cents per kW, which is becoming more common these days. Did you know 1kW of panels exporting power [NSW] over 365 days @ 6 cents is only going to return? You paid a lot of money for each kW of solar panels. So let us help you speed up the ROI! What we are offering here is to get you the 'need to know data'! We will transfer the data from your current energy monitoring dashboard, onto PVOutput. We only ask you for a few details! Having both your solar and consumption data on PVOutput, will allow you to truly manage your solar investment and finally reduce electricity costs. In a NET FIT environment you simply NEED TO KNOW when to use your solar power to offset costs! This above logics applies 100% when your export rate is less than your import rate. In some cases you may be getting more for your export than your import, so the same does not apply.